The $39.95 screen protector is no longer available to purchase from Belkin's website or Apple's online store after dozens of customers—but not all—complained about it cracking in normal usage conditions and without ever dropping their devices. We're told it has also been pulled from shelves at Apple retail stores around the world. When we first reached out to Belkin about the InvisiGlass Ultra's many one-star reviews in November, a company spokesperson informed us that it had not identified any issues with the screen protector at the time. It has since changed tune. "We have been constantly testing this product since we released the first generation of it timed to iPhone X availability and things have evolved since you and I last spoke," a Belkin spokesperson informed MacRumors. "We identified some improvements to be made in the next generation of this product." Belkin said it considers "product quality and consumer feedback of paramount importance" and said that customers who have any questions should contact the company directly or reach out to their local Apple store. Belkin didn't specify if customers will be eligible for a refund, but hopefully it honors these requests. The original InvisiGlass Ultra uses 0.21mm ion-strengthened glass from iPhone display glass manufacturer Corning. 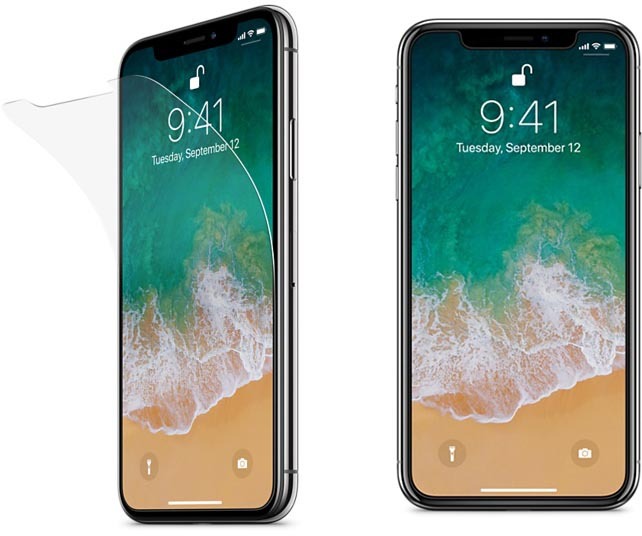 Belkin said the screen protector improved the iPhone X's scratch resistance by up to three to five times, with up to a 25 percent increase in protection against cracking and breakage from drops. The InvisiGlass Ultra was released in late October alongside Belkin's anti-glare and tempered glass screen protectors for iPhone X, which both remain available to purchase for $19.95 and $24.95 respectively. Who the hell pay $40 freakin for a screen protector. No wonder why Apple can sell a $1000 phone because of these suckers. SMH! I don't understand the need for these protectors. I've never been gentle with my iPhones, and have never seen so much as a hairline scratch on the screen. The iPhone 6S that I replaced with a X looks brand new. Buy the cheap-ola protectors on Amazon. Plenty of great options for $10 and less (and Prime eligible). They come out of the same factories as the "name brand" one, and no worse. Same material. It baffles me that people pay $20, $30 or more for these. Here's a tip, don't bother with one - the screen is perfectly fine as it is. Same thing with my Belkin iP7+ screen protector last year. Applied in the Apple Store and within a week a small crack had appeared (thin line) on the top right of the phone. Honestly: It never fell, no enormous amount of pressure was applied... really bad quality... Took it into the Apple Store: They didn't care and told me it must have "done its job". Called Belkin: They didn't care. It's easy to just rid complaints down to the obvious "you must have dropped it" and the customer has no way of proving the opposite. Recently bought 2x Anker Glass Protectors (€7,99 on Amazon) and they're holding up well. Application was easy with the included kit and the protector is a little wider than the Belkin one which means the edges of the screen don't get this "rainbow" effect. Cheaper, better, ... Belkin? Never again. I’m curious why people use these. Personally me and my wife have never used one and I’ve only ever had one scratched screen. That’s was on my iPhone 4s. Currently our iPhone 6 pluses are 3 years old and neither have scratches. I carry mine in my pocket with change and my keys. My wife’s goes in her purse with everything. We have cases on them but no screen protectors. I know this is just our experience but it just doesn’t seem necessary at least for us. Do others have differing experiences? Belkin has temporarily halted sales of its InvisiGlass Ultra screen protector for iPhone X ('http://www.belkin.com/us/p/P-F8W862/') after numerous complaints about it cracking way too easily. The $39.95 screen protector is no longer available to purchase from Belkin's website or Apple's online store after dozens of customers--but not all--complained about it cracking in normal usage conditions and without ever dropping their devices. We're told it has also been pulled from shelves at Apple retail stores around the world. Here's one customer review from Belkin's website:When we first reached out to Belkin about the InvisiGlass Ultra's many one-star reviews in November, a company spokesperson informed us that it had not identified any issues with the screen protector at the time. It has since changed tune. Belkin said it considers "product quality and consumer feedback of paramount importance" and said that customers who have any questions should contact the company directly ('http://www.belkin.com/us/support-article?articleNum=55022') or reach out to their local Apple store. Belkin didn't specify if customers will be eligible for a refund, but hopefully it honors these requests. The InvisiGlass Ultra was released in late October ('https://www.macrumors.com/2017/10/27/iphone-x-screen-protectors-belkin/') alongside Belkin's anti-glare ('https://www.apple.com/shop/product/HLR22ZM/A/belkin-anti-glare-screen-protection-for-iphone-x') and tempered glass ('http://www.belkin.com/us/p/P-F8W861/') screen protectors for iPhone X, which both remain available to purchase for $19.95 and $24.95 respectively. After my bad Belkin InvisiGlass experience with my iPhone 7 Plus as it broke so easily, I do not trust Belkin InvisiGlass protection anymore for iPhone X. The steep price of it is not worth it. Instead, I am using the anti glare version. I am glad Belkin finally takes a corrective action. Agreed. I condone the use of screen protectors and I think they serve their place for certain iPhone users that want added protection. But none of my displays have had any scratches or issues without the use of a screen protector, which are near perfect condition. I think it truly comes down to how well you take care of your iPhone and the environment it's exposed to every day. No more then a few years ago you could get one installed for under $10. Nowadays $40 is common :rolleyes:. I bought an Amazon folding case for $20 which provides protection all around.